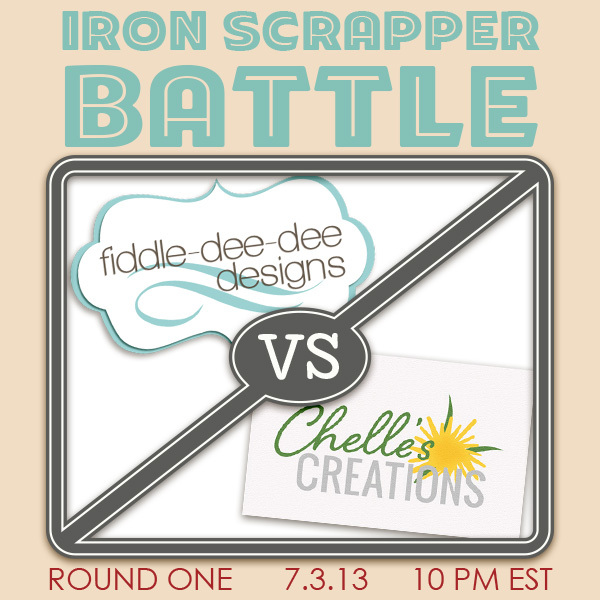 Join me on Wednesday, July 3, 2013, at 10 PM EST for Round One of our Iron Scrapper Battles! I will compete head-to-head against Chelle of Chelle's Creations. We'll have one hour to scrap a layout using the instructions they give us at the beginning of the crop! Everyone who attends the crop will receive a point in our Iron Scrapper contest, a little freebie, a sneak peek at the upcoming Iron Scrapper Weekly Challenge and be offered the advantage of purchasing the Weekly Bundle before it is released for sale! Please stop by the Scrap Orchard forum **CLICK HERE** for full details about our night of fun! Really looking forward to seeing what you come up with :-) Good luck! good luck! can't wait to see the results!! Iron Scrapper Week One Mega ~ GIVEAWAY!